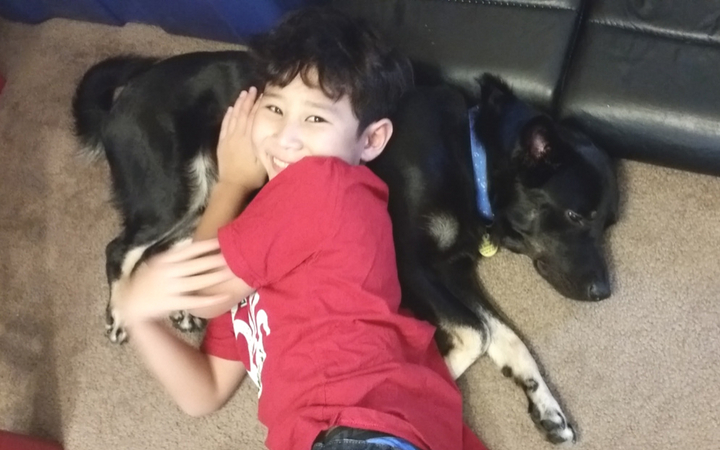 A shelter dog proved an unlikely hero to an Army family and their autistic son, giving both boy and dog a second chance and bringing many blessings to everyone in the household. Joe is assigned to the U.S. Special Operations Command out of MacDill Air Force Base. Since 1989, he has served in the United States Army and traveled the world with his wife, Stephanie, their two sons, Chance and Cole, and the family’s Siberian Husky, Abby. The dog was part of every Permanent Change of Station (PCS) move, traveling to Wiesbaden and Heidelberg, Germany; Montgomery, Alabama; Fayetteville, North Carolina and Tampa, Florida, just to name a few. Representing the United States abroad as a military family is a highlight of Joe’s career. Both of his sons were born in Germany, in the very same Wiesbaden hospital. Frequent moves to far flung places is a fact of life for this military veteran and his family. Sadly, this next move will not include Abby; the eight year-old dog passed away. Being such an intricate part of their military family, it caused great sadness when she died. Adopting another dog was not something Joe was prepared for, however. He had been the main caregiver for Abby and, as a dog lover, the death of his companion hit him hard. Joe took a trip to the Humane Society of Tampa Bay, a Pets for Patriots adoption and veterinary partner, to look at the available dogs. There he learned about our mission to connect at-risk shelter pets with military veterans, improving their emotional, mental and physical well-being – and, in this case – those of their family members as well. The Army veteran qualified for Pets for Patriots’ membership and after several visits to the shelter his two boys spotted Rocky, a then two year-old black Shepherd mix with white socks. Joe wanted to be sure that Rocky would be a good fit as an autism service dog. While some people do train rescue dogs for service, the vast majority of shelter pets have neither the aptitude nor attitude for this type of work. Whether this challenge would stress Rocky or motivate him to succeed was anyone’s guess. After a two week trial period Joe adopted Rocky, and the former shelter dog is now on his way to becoming a full-fledged service dog for Chance. Rocky has learned commands such as “find Chance” and “up”- moving closer to Chance when he gets upset, crawling onto his lap and calming him down. Rocky is currently in the process of learning “give love,” where he will lick Chance’s face when simply crawling onto his lap to be pet will not work. The big dog with the white socks will soon start attending school with Chance to help with his anxiety. However, Chance and Rocky are not the only ones who have formed a close bond; the dog has proven himself to be an equal opportunity family pet. The children are not the only ones who benefit from the big dog’s abundant love. Rocky has come a long way, adapting well to both his new family life and to his job as a fledgling service animal. While he is already well on his way to completing his required 800 hours of documented training, it was clear that the once homeless dog had much to learn. The Army officer feels “blessed” to have adopted Rocky. The concerns he once had about not knowing the dog’s mixed-breed heritage and whether he would fit with the family are a distant memory – and opened his eyes to the value of older companion pets. As an adult companion dog at the time of his adoption, Rocky meets one of our criteria to receive program benefits. Our goal is helping military veterans adopt the most overlooked shelters dogs and cats – adult and special needs animals, and large breed dogs – and providing benefits to make pet guardianship affordable over the life of the pet. I am a proud supporter of not only Pets for Patriots but also the A.S.P.C.A. If only each person who professes to be an animal lover, would send a contribution to any one (or more) of the agencies that provides protection for our homeless/rescued animals, what a better world this would be! God bless the “Joe’s” of the world. We need more like him!